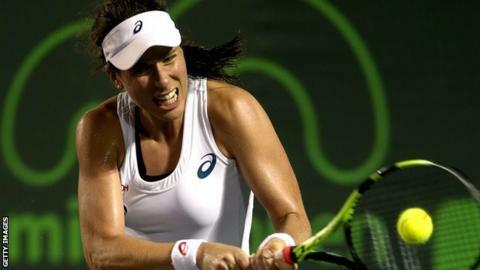 Johanna Konta reached round three of the Miami Open but fellow Briton Kyle Edmund was beaten by Novak Djokovic. Konta, the 24th seed, saw off Montenegro's Danka Kovinic 6-4 6-2 to set up a third-round meeting with Russian qualifier Elena Vesnina. Edmund lost the first four games but fought back before world number one Djokovic prevailed 6-3 6-3. "I felt like I did put my game out there and tried to play some aggressive tennis," said Edmund. "At points it worked, it shows I can be aggressive, but at times I need to find the balance." The British number one lost her opening service game, but there were no further alarms as she broke world number 51 Kovinic four times over one hour and 24 minutes. "It was much closer than the second set score showed," said Konta. "We had a lot of deuce games, a lot of back and forth. "She's been pushing some of the best players in the world to quite the limit in the last couple of weeks, so I was really happy how I was able to compete against her." Vesnina beat Venus Williams in three sets, and will look to repeat her victory over Konta from their only previous meeting four years ago. "I've played her I think only once before - I definitely lost to her that time. I'm definitely looking forward to the challenge." The 21-year-old from Yorkshire looked like he might suffer a swift and humiliating fate when he trailed 4-0, but Edmund broke serve to stop the rot and managed to make some headway with his heavy forehand. Edmund detained the top seed for 80 minutes, without ever threatening an upset. "He's always there constantly, every point," said Edmund. "He doesn't give you many cheap points. That's why he's so tough to beat. "It's one thing watching on TV but now to actually experience it you can see why." Djokovic was impressed by the British number three's "big forehand" and physical strength, saying: "He definitely does have the potential to step up and get himself to the top of the men's game. "How far he can really go, that depends on him and the people around him. But having Andy Murray as someone who can mentor him is a great advantage for Kyle. "I'm sure he's using that wisely and he has a lot more time in front of him, but he has learned a lot so far."